Later, over at the theater, we stood in a long line outside waiting for the power to come on again. It did for a few seconds, and people cheered. Then it went off again. At 7:40 or so, ten minutes after the show was due to start, they cancelled it. I’m looking to see if it’s being re-scheduled. 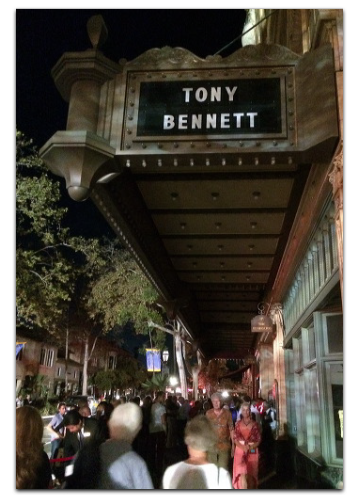 But I see nothing on Tony’s site (many parts of which appear not to work), the Granada’s site, or at Arts & Lectures, toward which we were told to look when we departed the scene. If anybody knows, pass along the news. Still love to see him. Hi Doc! I attended the rescheduled show on 10-12-2014, shot some photos and took down a detailed setlist for any one who might like to learn about it. It was a great evening and Mr. Bennett sounded superb!